This book is a fantastic and original resource for students and teachers alike – a must for tackling forced marriage”. When I think of modern-day heroes, Aneeta Prem is always top of my list for her tireless campaigning against forced marriage. In But It’s Not Fair, she shows how the young can help a friend who is being put through this trauma. It could be the most important book a teenager ever reads; if you want to be a good friend, start it now. A book that deserves to be read by everyone who may be touched by forced marriage or know someone who may be at risk. Its only through education that we will save lives. 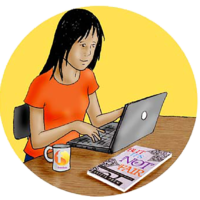 But it’s not Fair” is a useful and vital resource for schools and young people in raising awareness of forced marriage and other forms of dishonour abuse. No young person’s life should be marred by such abuse. This publication makes an important contribution to the ongoing campaign to eradicate all forms of violence and ill-treatment of young people. Your Editor noted that this book was a non-judgmental, fictional account of different perspectives on forced marriages, giving the background to the views of the traditional family and the families arriving to settle in this country. At the same time it showed the horrors of girls of 14- 16 being taken against their will to India/Pakistan, forced to marry and often being beaten and badly treated by the new husband’s family and with little prospect of any contact with their families here. The repercussions on families and school-friends are described, together with ways in which fellow pupils and adults can be alert and know what action they could take. It is a complex situation which requires careful handling. 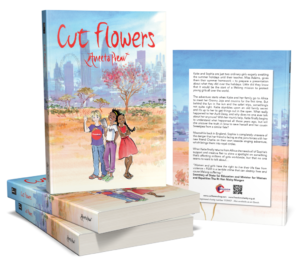 I think the book is essential reading for school children, teachers and all those involved in dealing with the wider situation – for example, better integration of immigrants – and for anyone who wants a reliable understanding of this issue. 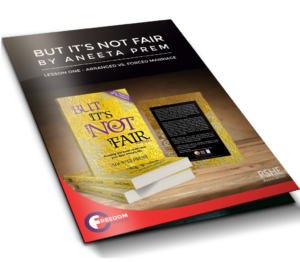 Today Aneeta Prem the Author of “But It’s Not Fair” came over to my school in an order to launch freedom charities help text line. She is Amazing and today I have to admit Aneeta had inspired us by coming to our school and especially she has helped me expand my knowledge on something’s I had not been entirely aware about. She shared some of the most unpleasant experiences she had dealt with in her life, which of course helped her to understand and develop her understanding upon parents forcing their children to do something’s which they do not wish to do, where some therefore take it to the extreme and end up scarring their child’s life which remains within them forever. Hello, Aneeta did an assembly in my school today about forced marriages. Also provided my school a book called “But its not fair” . I would love my own copy of the book. Please can you kindly provide me with a copy of the book? The book tells the truth of forced marriages, and how it often goes unspoken of. It also shows how it can be stopped.